Weekly articles about business and this thing called the Internet. 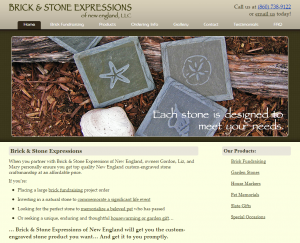 We are excited to announce the launch of the new website for Brick and Stone Expressions. Brick and Stone Expressions creates original and unique stone products for fundraising projects, memorials for pets, monuments for significant moments and events, decorative stones for gardens, and even drink coasters and other specialty products. Brick and Stone Expressions is able to offer custom designs that express your personal sentiment or capture your corporate identity. Their website needed to showcase the wide variety of stone products and designs they offer and communicate to potential customers the various options available. Congratulations to Brick and Stone for launching a new web site with North Forty Road. You can visit the new site at http://brickandstoneexpressions.com/. North Forty Road Web Design specializes in high-end, custom websites for small businesses and individuals in Connecticut and beyond. Our advice is on the house! Contact us for a free consultation. Is your business a relationship business? Promote your blog? Here’s how. Put the phone down. Now. You must believe… in you. What is Responsive Mobile Design, and why do I need it? WordPress: To Update or Not To Update?